Innovative techniques continue to evolve the field of orthopedic surgery. In the ‘70s the development of the arthroscope radically changed the course of knee surgery. Dr. Louis Meeks was a pioneer in the field of anterior cruciate ligament (ACL) reconstruction that we now do arthroscopically. ACL reconstruction is the operation I have helped develop with other colleagues across the country over the past 25 years. I think we’ve finally got an excellent operation that’s done as an outpatient surgery. Knee1: How has the practice of arthroscopy improved the lives of people who suffer from debilitating conditions that cause pain or lack of mobility in the knee? Dr. Meeks: The knee is the most complex joint in the body. I agree with Hippocrates who, in 400 B.C., described the ACL as the Anterior Crucial Ligament; he felt it was crucial to the stability of the knee. We, and our athletes, feel the same way. I think that arthroscopy allows us to treat an injury that previously would have changed an athlete into a spectator. We can now do an outpatient procedure using arthroscopic instruments and techniques, and get 90 percent of our patients or athletes back to their pre-injury level of sport, whether it is professional football or professional ballet. This procedure has been a huge advancement in the last 20 years, specifically the last 10 years. Knee1: I understand that you use allografts for ACL reconstruction. Can you explain what this is? 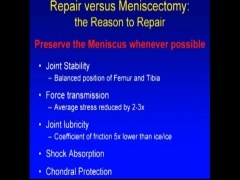 Dr. Meeks: The torn ACL is removed arthroscopically and a graft or template is inserted. The knee proceeds with a biological response and within 12-18 months, it forms a new ACL. The collagen template can be an allograft (donated tissue - transplant) or autograft (the patient's own tissue). I use both autograft (patient's double looped hamstring tendons) or allograft, an Achilles tendon harvested from a donor at the same time other organs are surgically harvested for transplant patients, i.e., heart, kidneys, corneas, etc. The ideal ACL graft should allow immediate rigid fixation, rapid vascularization and ligamentization. The ultra biologic structure should be comparable to the young human ACL. At the present time there is no autograft, allograft or synthetic material that satisfies all of these requirements. In choosing an ACL graft, I need to consider its initial biomechanical properties, initial fixation strength, fixation site healing and donor site morbidity. Knee1: What are the benefits of using the allograft procedure? But there are disadvantages: Concern about donated tissue is the perceived risk of viral disease transmission. This incidence, based on the widespread use of allografts for many, many years, is estimated at one case per 1.7 million procedures. Animal studies have demonstrated that allograft and autograft tissues undergo the healing process but it takes perhaps six months longer for the allograft. So, return to sport is delayed up to six months. Although the patellar bone tendon autograft has often been referred to as the "gold standard" for ACL reconstruction, there are no studies showing it to be superior to four-stranded hamstring tendon grafts, the central quadriceps tendon, or allografts. One must not forget the importance of the surgeon's experience, skill and ability to safely harvest and use different types of graft tissue. Knee1: Who, in your opinion, is the ideal candidate for this type of surgery? Dr. Meeks: The ideal candidate would be someone who suffers from an unstable knee during daily activities. An unstable knee develops early degenerative arthritis, torn menisci and chondral lesions. A person who has suffered an ACL injury and enjoys rotational sports and fitness activities may also benefit from this procedure. Knee1: You have written an article entitled “What’s New in Orthopedic Surgery.” It was published in the Journal of the American College of Surgeons in February 2000. What are some of the new innovations and how is orthopedic knee care evolving? Dr. Meeks: I felt very honored to be chosen by my colleagues to pen that report. I think that we have evolved from the mechanical age of chisel, hammer, and artificial joints into the biologic age in which genetic engineering and gene therapy is very exciting. We have seen a case in Pittsburgh, where they treated a terrible, debilitating condition of rheumatoid arthritis in a patient with viral induced gene therapy. The parameters are just unlimited and the genome is very important in orthopedics. In fact, the decade of 2000-2010 has been designated as the decade of musculoskeletal medicine around the world. There are going to be great strides to increase funding for continuing research in genetics. Knee1: So genetics will change surgery? Dr. Meeks: Absolutely. We are able to take very basic stem cells that are multi-potential and put them into the knee where they will grow into a meniscus or into an ACL. In the near future, instead of replacing and reconstructing the ACL, we will be able to form a small bridge where it has torn away from its bony attachment and insert a matrix of collagen with these stem cells, it will then grow and reattach itself and ultimately revolutionize knee surgery. Knee1: What do these gene therapy innovations mean for patients who would traditionally be offered surgery as a form of treatment? Dr. Meeks: It is my impression that a lot of the artificial knee joint replacements, (there were over 220,000 performed in the US last year), won’t be necessary 15 years from now. We have arthroscopy, and when somebody tears a small meniscus cartilage within their knee or has an injury, we can correct it early through the arthroscope as an outpatient procedure. Hopefully, they will not develop the post-traumatic, or post-injury degenerate arthritis that causes so many patients to be terribly impaired and forces some of them to become candidates for artificial knee joint replacement. Knee1: In addition to maintaining your practice, you are also a clinical instructor for Harvard Medical School. Can you tell me a little about that? Dr. Meeks: I think teaching is the world’s greatest profession. It gives us immortality. What we do can be passed on to the next generation of medical students or children or orthopedic surgeons. I have always felt that teaching was my role in life. I have been fortunate that the Beth Israel Deaconess is a major Harvard teaching hospital and I have had the opportunity to teach at all levels. My associate, Dr. Zilberfarb, and I currently teach the senior residents in orthopedic surgery at Harvard Medical School. They take this course four years after graduating from medical school. It is a master’s course in arthroscopic and ligament reconstruction in the knee and shoulders. This rotation lasts for six weeks and is imperative for these residents. They are very enthusiastic skilled young surgeons and a large number of them decide to go into sports medicine as their career. Also, because I’m gray-haired and know a lot of people in the fellowship programs across the country, I have had the opportunity, or privilege, to write their letters of recommendation. Through this opportunity I find my immortality. Hopefully, I can maintain my enthusiasm, which I have not lost in the 30 years I’ve been practicing sports medicine and arthroscopic surgery. I was very pleased this year to receive the Daniel D. Federman Outstanding Clinical Educator award that is given to a faculty member who has “Unselfishly devoted their professional lives to academic and clinical teaching.” That is a great honor. Knee1: How do you prepare these young surgeons for a future, which might be more biologically oriented than surgically oriented? Dr. Meeks: I think we are very privileged in that orthopedics is an exceptionally popular subdivision of medicine and of surgery. The people that choose it, and are chosen to proceed with a residency in orthopedic surgery, are extremely bright and extremely overachieved and their backgrounds in genetics in college and medical school is overwhelming. They are all comfortable with computer skills and the genes, so we learn from one another. One of my residents is now working on genetic bridging of the torn ACL. She is taking a year off to work in what is considered the forefront of development in this area before she goes on to take her fellowship in sports medicine. We teach each other, but when it comes to computers and the basic science of genetics, I learn from them. All I have to do is motivate. Knee1: When do you think these developments will become as standard as the practice of arthroscopy? Dr. Meeks: Within the next five years, I’m convinced. It’s just very exciting. We may have to put away our scalpel. Knee1: Do you look forward to that change? Dr. Meeks: Whenever there is change it is scary, but being scared makes you overly enthusiastic and want to overachieve. I think we are all scared particularly with the dangers associated with gene therapy. We have to make sure these outcomes are well controlled and safe. That’s what scares me, the safety. But overall the techniques are very exciting and they will be here within the next five years.